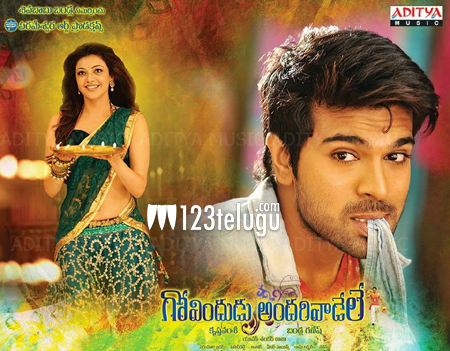 All the basic formalities, and so called last minute adjustments have been cleared for Ram Charan’s latest flick Govindudu Andarivadele. Directed by Krishna Vamsi, GAV is set to open in nearly 2000 screens all over. Special fans shows, and premieres have been planned all over the world. Producer Bandla Ganesh is quite confident of his project, and is expecting a thumping opening all over. Kajal Agarwal is playing the female lead, and other senior actors like Prakash Raj, Jayasudha and Srikanth will be seen in other supporting roles.